Mass Media Mentions. 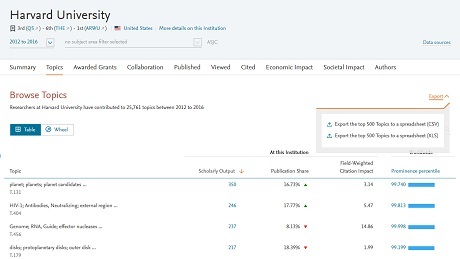 View the underlying sources of your institution's media mentions to see what research is being covered by the media, by what channels and in which countries. ORCIDs to define Researchers. You asked for it! Therefore you can now create researchers using their ORCID. Topic Prominence in Science: Export top 500 Topics! 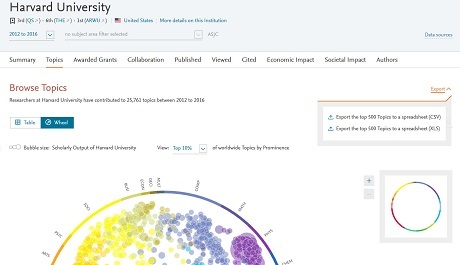 Based upon your feedback you're now able to identify and export the top 500 most prominent Topics for your institution or organization. View the underlying sources of your institution’s media mentions to see what research is being covered by the media. Are your researchers’ papers being referenced by Harvard Business Review or local news publication? Which media channels in a particular country, are showing the most interest in your research? Now you can see it for yourself in SciVal! You can now define researchers using their ORCID. ORCID (Open Researcher and Contributor ID) provides a unique, persistent digital identifier to every researcher, and helps to distinguish you and your work from the millions of other researchers. In order to define any Researcher by their ORCID, it must be connected with their Scopus author profile. As part of our continuous updates to the Reporting functionality, it is now easier to sort through all of the analyses and reports, which you have generated. You can also search for a specific analysis, saving you time when creating your recurring Reports. Topic prominence in science: Export top 500 topics!